Just this morning I met a lovely 90-year-old woman artist who described the pain from her liver cancer and wondered why so many people have cancer now. She pondered aloud: Is it something in our food? A lot of people are wondering the same thing. What would you do if you learned that many of our foods – including some fresh produce and meat but mostly processed foods made with such ingredients as beet sugar, corn, or soy – are toxic from man-made, genetically modified organisms (GMOs). At times I have become frustrated, learning important information about food made with GMOs yet seeing no discernable steps toward creating change. Now there is a chance to get involved and take action to preserve the safety of our food. I pondered many questions on my journey toward healthy food and the preservation of our seed bank. The fact is that in the United States up to 80% of processed foods are contaminated with GMOs. You may wonder: What is genetically engineered food? Genetically engineered food comes from seeds or animals that have been altered on a molecular level by genes from other plants, animals, viruses, or bacteria. There is a long list of reasons and excuses for the inclusion of GMOs in our foods. The initial scientific ideas were that genetically modified crops would increase production and reduce pesticide use for farmers, but this has proven faulty over time. There’s no doubt that many Americans are interested in ingredients so that they can avoid allergens and, in general, consume food that promotes health. So why don’t we know more about GMOs in our food supply? Because the normal FDA regulations were side-stepped; new product testing did not occur to determine the safety of genetically modified (GM) foods. There is currently a campaign in California to pass a statewide initiative to label foods that contain GMOs, and if you want your food labeled, this is your chance to get involved. Once enough signatures are gathered, the measure will qualify to be on the ballot for the November 2012 election. Is mandatory labeling a new idea? Not at all. Many countries internationally require GMO labeling. Fifty countries, in fact, containing more than 40 percent of the world’s population, already label genetically engineered foods. Yet the United States not only fails to require labeling, it actively prohibits the labeling of non-GM food in the U.S.
European Union regulations require labeling to distinguish foods produced from GM crops from those made with conventional or organic crops, due to high demand from European consumers for freedom to choose between GM and non-GM foods. 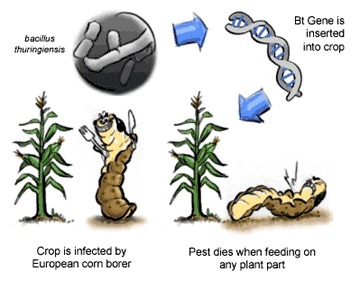 In addition, genetically altered crops in the field pose a hazard of contamination to conventional and organic crops. An enormous majority of Americans, too, want to know which foods they consume contain GMOs, according to national surveys. Yet a false “mutual equivalency” claim allowed Monsanto and other corporations to skip the FDA’s federally mandated testing for a new food product. This was based on the argument that GMO food products are “the same” as food products that have not been genetically modified. It is ironic that these same corporations claiming “mutual equivalency” to avoid normal food safety testing and labeling also claim “exclusive patent” to GM seeds and animals. The California Right to Know Genetically Engineered Food Act would simply require that genetically engineered food sold in retail outlets be labeled. Once people know their food ingredients, they can make a choice to consume GMOs – or not. For more information and to volunteer please visit labelgmos.org. We can make a difference for the future of food.